Here's what's going on in my creative space today (as well as some secret things I can't show you)! My Madelinetosh Honey Cowl! This is my on-the-go and in-front of the tv project! It's just so soft and pretty and I can't wait until it's done! By the way, did you know that Kate Conklin and I share a birthday? I knew her birthday was this week, but her sister (Amelia) just informed me this morning that it was actually on the 5th! Happy birthday Kate - we're like twins or something (hah)! If you'd like to see some more creative spaces, head on over to Kristy's and join in the fun! I need to learn how to do this! Lookin' good! How cool is that!! We really could be twins if I was just 10 years younger!! Hope you had a wonderful birthday. 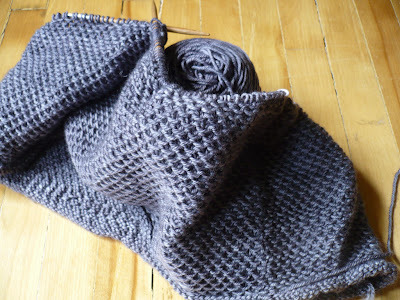 Your cowl is looking lovely, and will be so scrumptious to wear as the weather turns. ohhh that looks SO gorgeous! I want one in gray now!!!!! Wow! Wonderful blog (and honey work). Thanks for "hearting" my fabric stash on Etsy. I am glad I found you. Ha Ha, I'm the 5th too!